A mid-century, hand painted kitchen for a period property in South London. With a passion for mid-20th century design, our client commissioned this bespoke kitchen as the desired style was not available ‘off the shelf'. We conducted a period of thorough research, exploring historical photographs, materials and finishes from the era, to ensure the design replicated many desirable features rather than appear to be an adaption of a modern kitchen. Questioning how early mid-century kitchens were made at a time before standardised, off the shelf kitchen cabinets were widely available (and before computer aided design existed), we sought to produce a thoughtful, high quality product with personality, to look like a local cabinet maker had made it over half a century ago. The result was a kitchen consisting entirely of individually unique cabinets, almost all of which are of non-standard sizes. 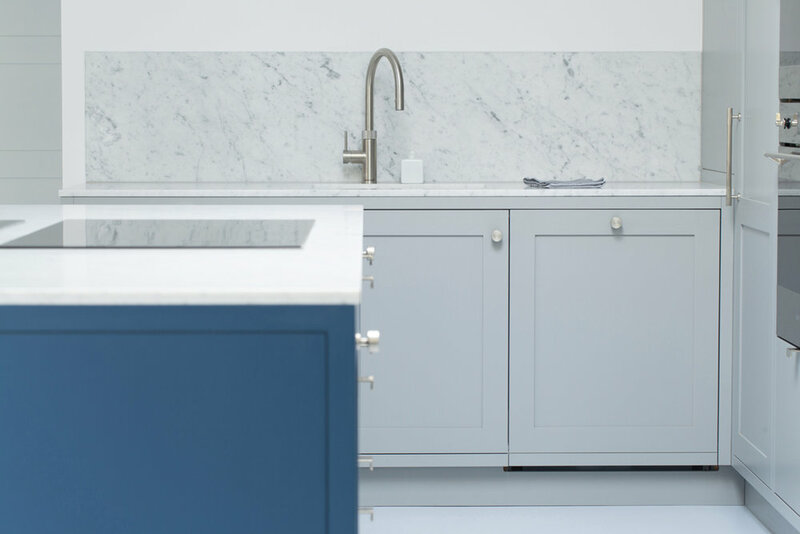 Particularly rewarding features include a durable hand painted finish, a sloped front wall cabinet with sliding, reeded glass doors and laminate worktops using a Formica® pattern originally designed by American industrial designer Brook Stevens in the 1950s. The laminate was discontinued some years ago, however we painstakingly tracked down what we required sitting on a shelf in rural France. The project demonstrates our versatility as designers and skilled makers, highlighting the value of research and collaboration to produce a practical and durable kitchen which brings a warm smile to everyone who sees it. This bespoke kitchen was part of an extensive architectural project that saw a substantial 20th-century detached property transformed into a bright and spacious contemporary home. The simple yet striking aesthetic was achieved through the combination of durable laminated external panels and white Corian® worksurfaces. American Black Walnut accents help soften the clean, crisp look. The large (3.2 x 1.2 metre) multi-use island, featuring an integrated breakfast bar, provides ample cooking and storage space. A successful feature of the full height elevation are two Walnut lined pantry style units, which contain additional work surfaces and storage space, concealed behind doors which open and retract neatly into pockets. A Miele fridge, freezer, dishwasher, three ovens and a warming drawer are all seamlessly integrated to help deliver this stunning, high quality kitchen. A worthy addition to this beautiful family home. This pared back Shaker kitchen created a new focal point for the home, located in a newly built space, linking the main property with a characterful outbuilding. Our clients approached us after becoming frustrated with the limitations of working with kitchen showrooms. We embarked on a thorough design process to help create exactly what they desired. Features include a premium, two colour hand painted finish (an in-house service we offer), fully integrated appliances, an Oak pantry style cabinet with marble lined work area and pocket doors, made to order door knobs and handles. 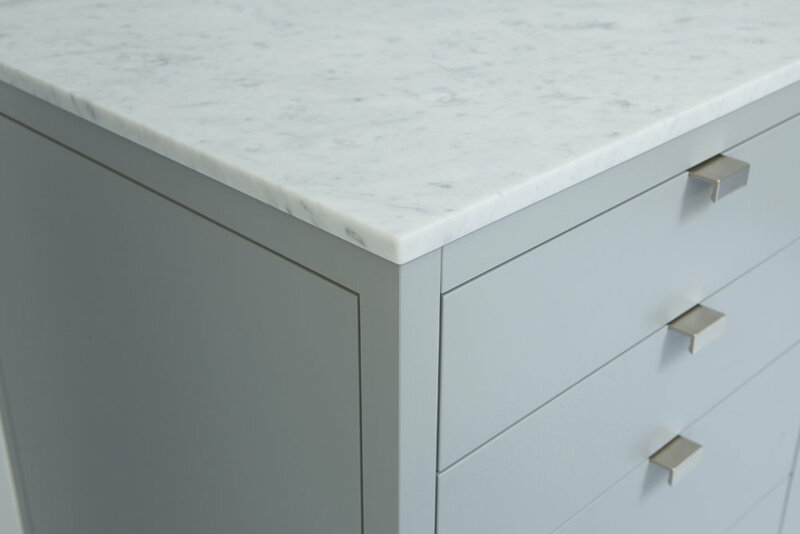 Honed (matt finish) Italian marble work surfaces and splash backs were the final ingredient to grant the project high end status. Immaculate small space. Our client commissioned a bespoke kitchen as part of a ground floor refurbishment. As often requested, an emphasis was put on storage space and making this space as accessible as possible, as our client was newly retired. Our client had always wanted a white kitchen, something durable and easily maintained. Three 700mm wide 540mm deep drawers were a major factor in making more of the storage space accessible. 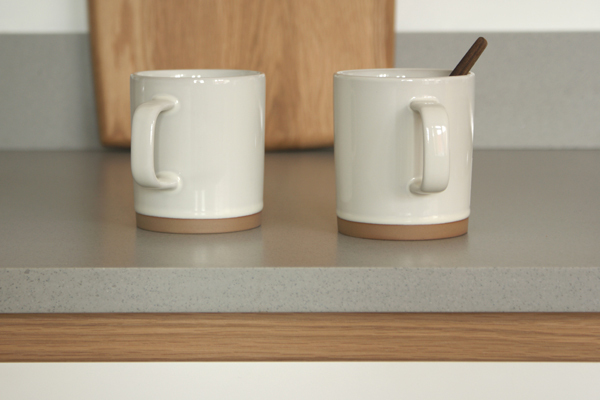 The most frequently accessed top drawer features bespoke cutlery and utensil divides, and a section dedicated to mugs and jars with ingredients for making tea and coffee. Slim in depth wall units create more easily accessible storage without imposing on the sink area below. 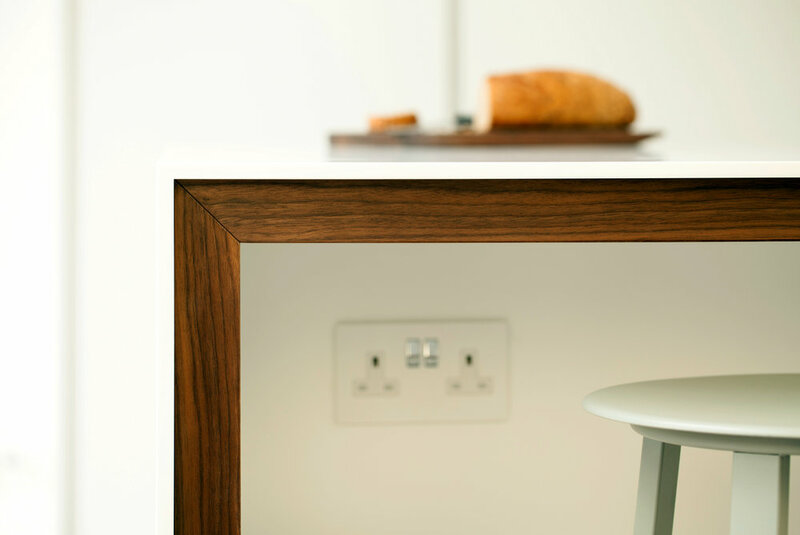 To reduce the clinical feel of the white and grey colour combination, solid and veneered Oak drawer boxes and detailing were introduced. 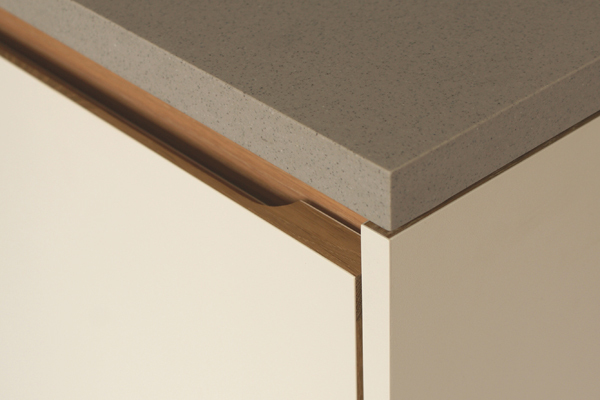 A seamless Corian® work surface and splash back add to the contemporary aesthetic.